We get it. You're on your feet. All. Day. Long. Let us show you how to relieve some of the discomfort that comes from an 8-hour(+) day on your feet. Join us for a fun night out were YOU get to be pampered. 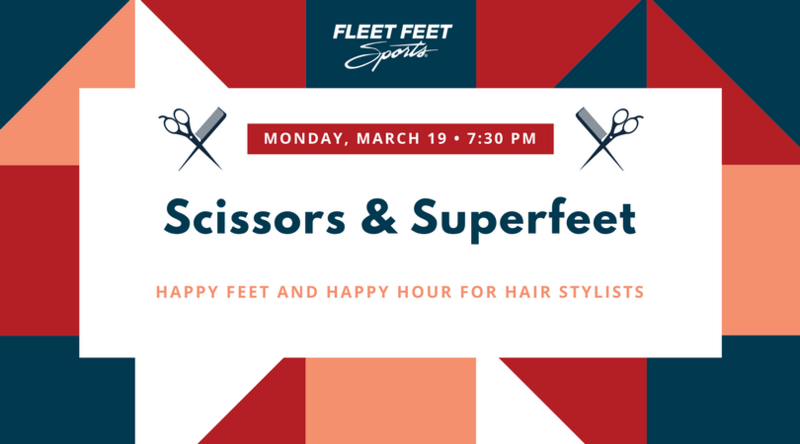 Invite your whole staff and stop by on Monday, March 19 at 7:30 pm for light appetizers, cocktails, and camaraderie while our staff shows you how to make your feet feel super. Do you want your feet to be super comfortable? Standing for hours, day after day on your unsupported, or inadequately supported, feet can lead to a wide range of foot health issues. Superfeet Insoles adapt the flat inside of your shoe to your foot. Superfeet are designed with durable foam to absorb shock and improve the fit and comfort of your footwear. Our Superfeet rep will be on hand to answer questions and we’ll have demo insoles - bring your work shoes and see what a difference an insole can make. All Superfeet will be 20% off and you’ll receive a great gift with purchase! Do you want to win something super cool? Bring your business card and you’ll be entered into a drawing to win one of three prizes: a $10 Fleet Feet gift card, a $25 Fleet Feet gift card or a FREE pair of Superfeet.